A strange formation appears in Arctic ice at 69.71° North and 138.22° West, about 50 miles northwest of Canada’s Mackenzie River Delta. NASA scientists flying over the Arctic earlier this month spotted strange shapes out the window, but they aren't sure what caused them. Three holes dot the sea ice, seen from the window of a NASA aircraft in the photo above, taken April 14. They're clustered together, each surrounded by one or two radiating layers of ridged, textured ice, almost as if a batch of archery targets had melted and gone lopsided. All around them are bumpy formations that mean the ice is thin and relatively new, NASA said in a statement. And Sonntag is used to seeing ice formations. He and his crew were flying over the Arctic as part of NASA's IceBridge mission, which aims to take over the work of studying ice from above during an eight-year period when NASA doesn't have any ICESat satellites doing the job. The failure to recognize the formation doesn't mean NASA doesn't have any clues. The rippling indicates the ice is mushy, young and thin, according to the NASA statement. The "finger rafting" on the right side of the image, where two sheets of ice meet and press together like interlocking fingers, indicates the same. 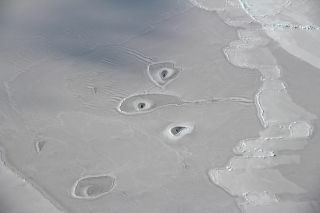 It's possible, NASA wrote, that some large mammal took advantage of that thin ice to poke holes through it to breathe.Ring sealsand harp seals are both known to poke holes through the ice that look somewhat similar to this (though neither of NASA's example photos includes the formations around the ice holes). Another possibility, NASA wrote, is a natural process of convection, in which warm water gathers at particular areas under the ice, causing it to melt. As for those encircling formations? Maybe seals pushed water up onto the surface when they stuck their faces through to breathe, and maybe that water froze in its wave-like form, NASA said. Or maybe there's something else going on that scientists just don't understand yet.